Other services include exterior home remodeling and repair with an emphasis on rain removal and ice control. Often called a “fascia wrap”, custom aluminum trim is often installed along with new gutters and gutter covers. Using a machine called a trim break, flat sheets of aluminum are formed to closely match the shape of a home’s existing wooden trim boards. Custom bend trim is installed over a homes existing wooden trim, eliminating the need to paint. Aluminum trim is available in over 50 colors including colors to match those of seamless gutters. The under side of a homes overhangs or eves is often called the soffit area. Aluminum trim or a vinyl product is used to cover a homes soffit, eliminating the need to paint. A soffit area being vented and allowing air circulation to a homes roof system can be very important. While covering a soffit area, additional ventilation can be installed. A properly vented soffit can help extend the life of roofing shingles, as well as helping to prevent ice build up and ice dams. With the installation of seamless gutters, gutter covers, fascia and soffit wrap, a homes trim area will become virtually maintenance free and will no longer require painting or gutter cleaning. 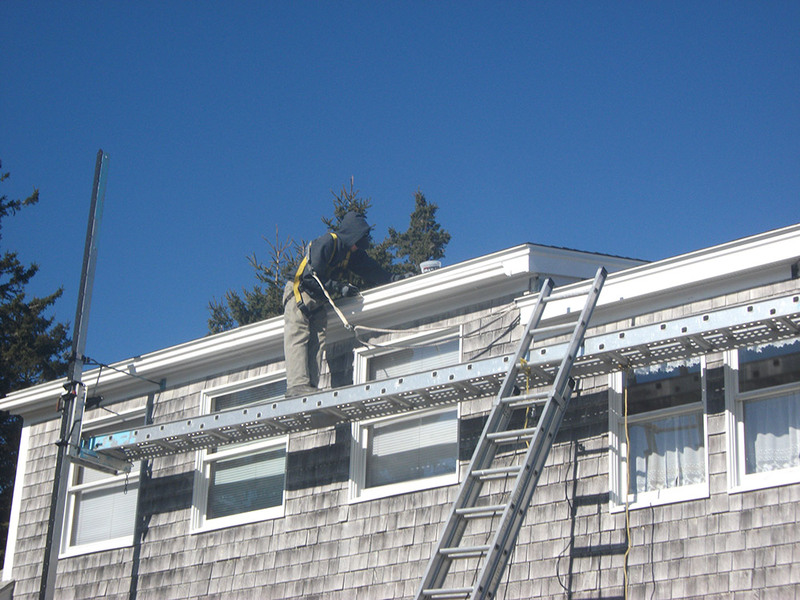 Before installing new gutters, all necessary carpentry repairs are performed to ensure a proper gutter installation. Trim boards are repaired or replaced with wooden or maintenance free vinyl composite face boards. New face boards are often painted or wrapped with custom aluminum trim. Job estimates will specify if carpentry repairs are part of the project. Ice control is an important role of a homes rain gutter system. Many building components work together, helping to prevent costly home damage and personal injuries that can result from ice buildup. Seamless Rain Gutters help to prevent icicles and divert water away from walkways. Heated Gutters And Covers help to keep water flowing through gutters that may otherwise freeze. Gutter Covers help to keep water flowing through gutters. Covers that are dark in color can draw the suns warmth, to promote melting of ice and snow. Ice Panels are very effective in preventing ice buildup and ice dams on roofs. Soffit Venting And Insulating can help prevent ice dams on roofs.